Take another look at your family research goals for the year. What will you do differently with your 2019 goals? I had the day off from work Monday. You know what that means, don't you? 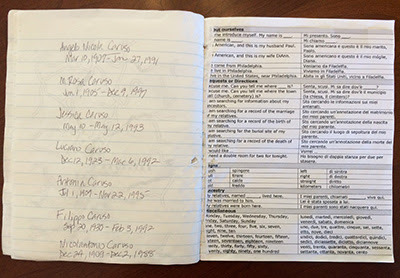 I decided I would try to complete an item from my list of 2018 Genealogy Goals. That item was to "Fill in the 'Need to find' column on my document tracker." 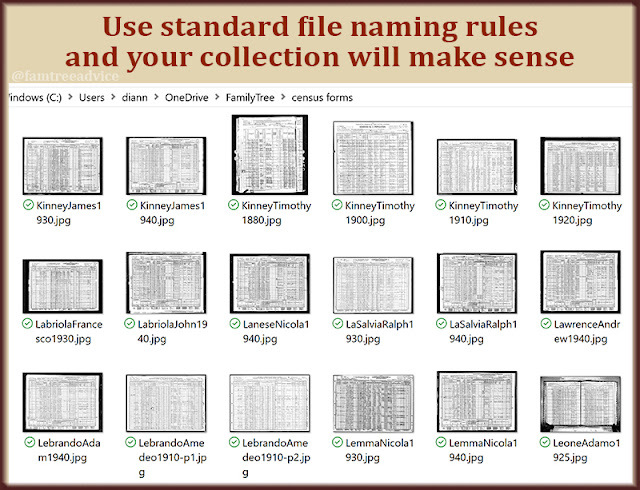 My document tracker is a spreadsheet noting each person with document images in my family tree. There's a column for major items: birth, immigration, marriage, censuses, naturalization, death, and several more. The last column is where I make note of which major documents are missing. If a person's census column contains 1910, 1920 and 1940, then the 1930 census belongs in the 'Need to find' column. Since I was giving attention to all 1,686 lines in the spreadsheet, I thought it'd be a good time to get more detailed. Your family tree probably has a lot of identical and similar names, too. 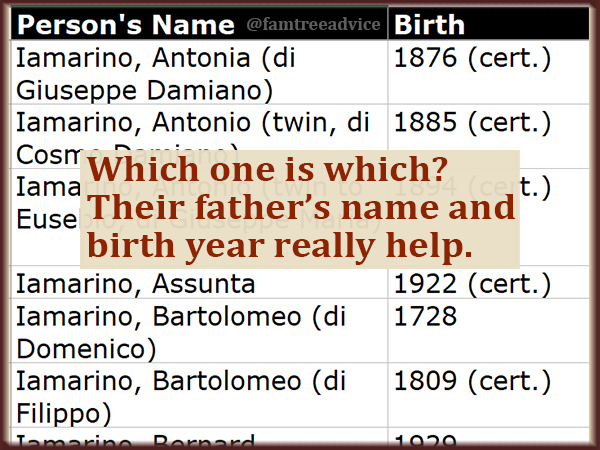 First, since so many people in my tree have the same name, I added their father's name in parentheses after their name: Lebrando, Alfred (son of Amedeo). Second, I filled in everyone's birth year, followed by "cert." if I have an image of the birth certificate. I use the word certificate only for birth, marriage and death certificates. Everything else is a document. Third, I put in other dates that I have reason to think are right, even though I have no document. Thinks about immigration. A census form will tell you someone's immigration year. But without the ship manifest, that's nothing more than a clue. When I do have the manifest, I enter "1909 (doc.)" for "document". After a few hours (with plenty of interruptions), I completed this 2018 genealogy goal. For 2019, I'll set another reachable goal, like trying to find every missing census form in the 'Need to find' column. The moment I finished this goal, I checked my list for what else I could do. I spent the rest of the day working on "Replace microfilm photos with digital document images". A few years ago, I had to view my Italian's ancestors' civil records on microfilm. Sometimes I photographed the microfilm viewer's surface as it projected a dark, blurry, awful image. My next goal is to replace the poor-quality document images with good ones. 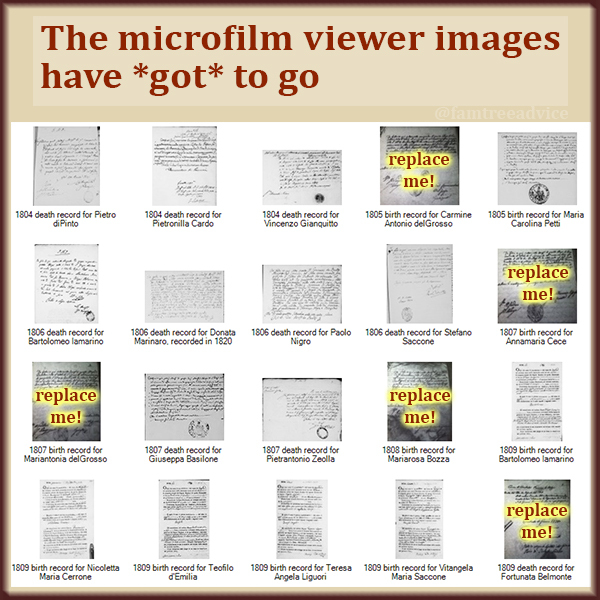 Now the same microfilm is available online in gorgeous, sharp, bright, high resolution. My goal is to replace the dark iPhone images (about 200 of them) with the great images I've already downloaded to my computer. And when I add the improved images to my family tree, I make sure they're noted in my document tracker. Soon it'll be time to make my 2019 Genealogy Goals official. Here's what I've learned about annual goals over the course of this year. Your goals should include grunt work. Choose tasks you need to do to make your research better. But make sure you have a good chance of finishing during the year. Filling out my document tracker was grunt work. And I finished it. Your goals should include projects with a definite ending. Last week I wrote a nice biography of my grandfather. I want to write more of them for about 10 of my ancestors. That's got a definite end. I know I can do that. Keep your projects to a manageable size. Your bigger goals should be broken into chunks. 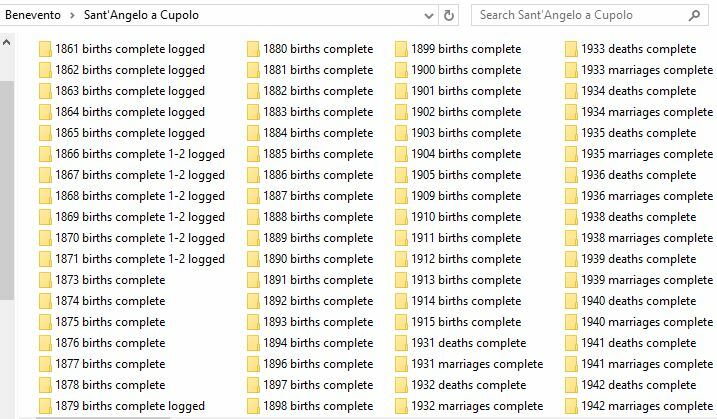 One of my goals for 2018 was to log the info from those thousands of downloaded Italian records into a spreadsheet. That's too big a goal. So next year I'll break off a chunk I think I can finish. 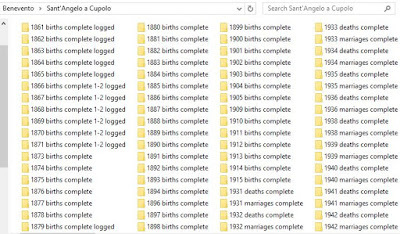 Like, "Log all the birth records from Colle Sannita" (my grandfather's hometown). 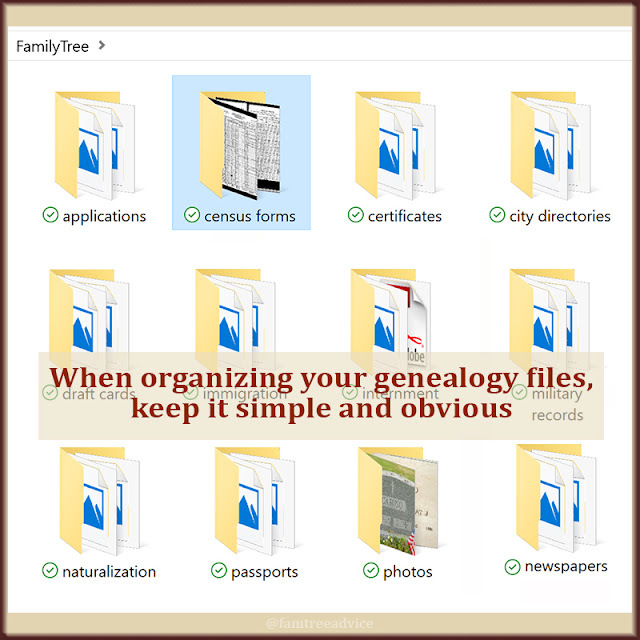 Save things you may not be able to finish in a year for your Genealogy To-Do List. One of my goals this year was "Find my parents' connection". DNA tells me they're about 4th cousins. I've been trying to find their connection, but nothing so far. That's not a good item for the goal list. It's leaving me feeling disappointed. Here are 2 things I'd like you to think about now. What goal can you possibly finish in the next 6 weeks? What grunt work, tasks or chunks of a bigger project should you put on your list of 2019 Genealogy Goals? Want to get more efficient so you can tackle those goals? I've seen many family tree researchers get ecstatic when they discover their ancestor's hometown records are online. For me, this moment came when I learned about the Italian website, Antenati. It has birth, marriage and death records for my four ancestral towns in Italy. Other genealogists are finding their ancestor's records on FamilySearch.org. That's a lot of records! How do you know what's in them? 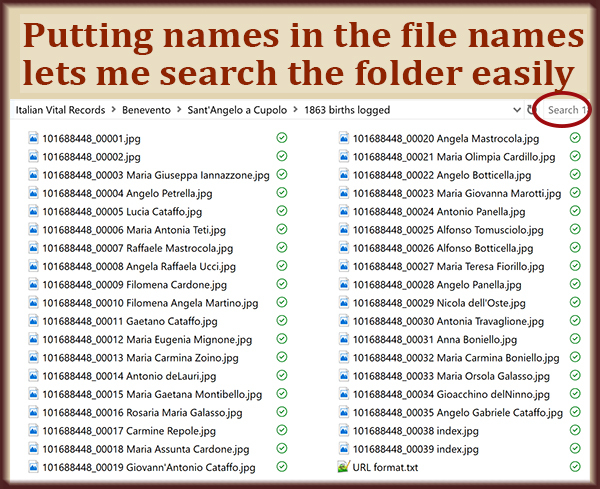 If you've downloaded documents from your ancestral hometown, you may have hundreds or thousands of images on your computer. If you're looking only at each year's index and finding what you know you need, you're missing the boat. And that boat is overloaded with your ancestors! My recommendation: Make a spreadsheet database of every important fact in each document. 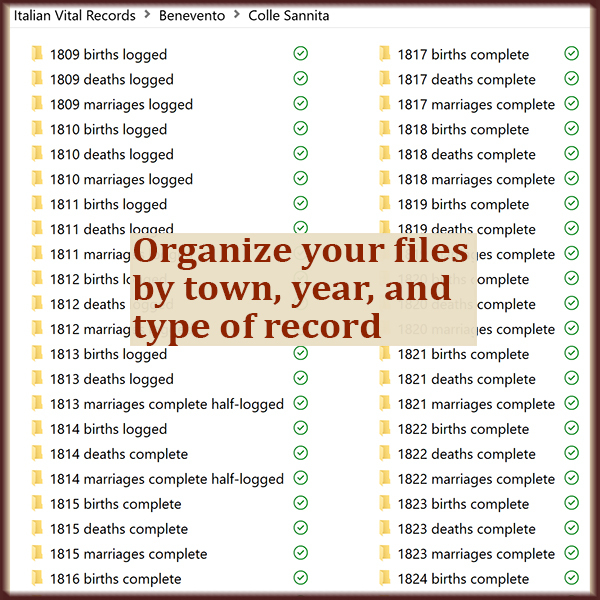 My database-in-progress for several towns' birth, marriage and death records. What's the point? With a spreadsheet of facts, you can sort an entire town's birth records by last name. If you sort by last name and father's name, you will see all the children born to your ancestor. There will no doubt be ancestors in your spreadsheet that you never knew existed. Examine the records for the fields you want to capture. For example, birth records may contain the baby's name and birth date; father's name, age and occupation; mother's name and age; their address; and the baby's baptism date. Death records will contain different facts, and so will marriage records. Create columns in your spreadsheet to hold all the facts. I keep birth, death and marriage records on different sheets in my Excel file so they can have different column headings. TIP: The best way to be able to sort your records by date is to keep the year, month and day in separate columns. Enter information from the documents into your spreadsheet. This takes time, but I found shortcuts as I did this last night. On my second pass through the records, I entered the birth and baptism dates. On my third pass, I entered the mother and father's information. Why is this better? I was always looking in one specific spot on the page for the information I wanted. It felt faster than going one document at a time, picking out facts from all over the page. Sort the data by any column to uncover hidden facts. You may find an unknown sibling. You may find that a man had several wives over the years. You may find that a family moved from one part of town to another. See Dr. Daniel Soper's YouTube channel for tips on using Excel. Many tips will apply to other spreadsheet software. Share your database! Years ago I documented the facts from the vital records for my grandfather's hometown. I gathered these facts while sitting at a microfilm viewer in a Family History Center, so I used a simple text file. You can't sort a text file, but at least you can search it. I shared this file, as well as a GEDCOM for the whole town, with other descendants of that town. 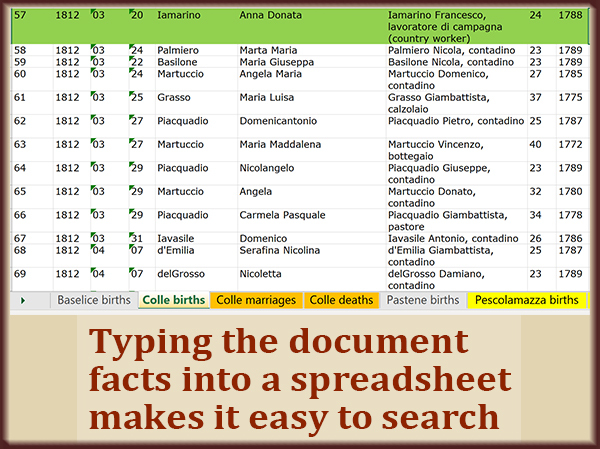 Your spreadsheet can be a valuable resource to other family tree researchers. Once you're done, I encourage you to share it everywhere you can think of. I completed two years of records while watching the Yankees slaughter the Orioles last night. I expect to get much further tonight because of the shortcuts I found. When you have your database, find an appropriate Facebook group or the like, and put the data out there. Genealogy is a collaborative sport! What if the you from several years ago could talk genealogy with the you of today? Do you think the two of you could help each other out? You're probably thinking that you've got so much more experience in family history now. You could teach so much to the past you. You could set her on the right course. You could tell her everywhere she's making genealogical mistakes. But guess what? Past you has a lot to offer today's you, too. Past you holds some keys to your family tree that today's you has completely forgotten. Today, past me and present me had a surprising collaboration. Here's what happened. 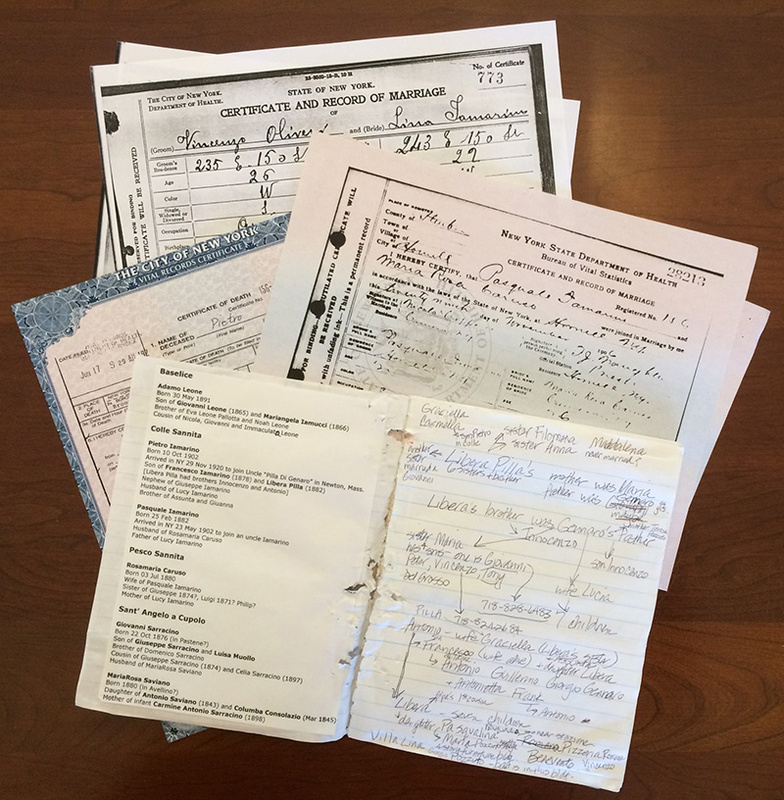 Digitizing death and marriage records is one thing. But notes are just as important. When I went to Italy in 2005, I brought a notebook. 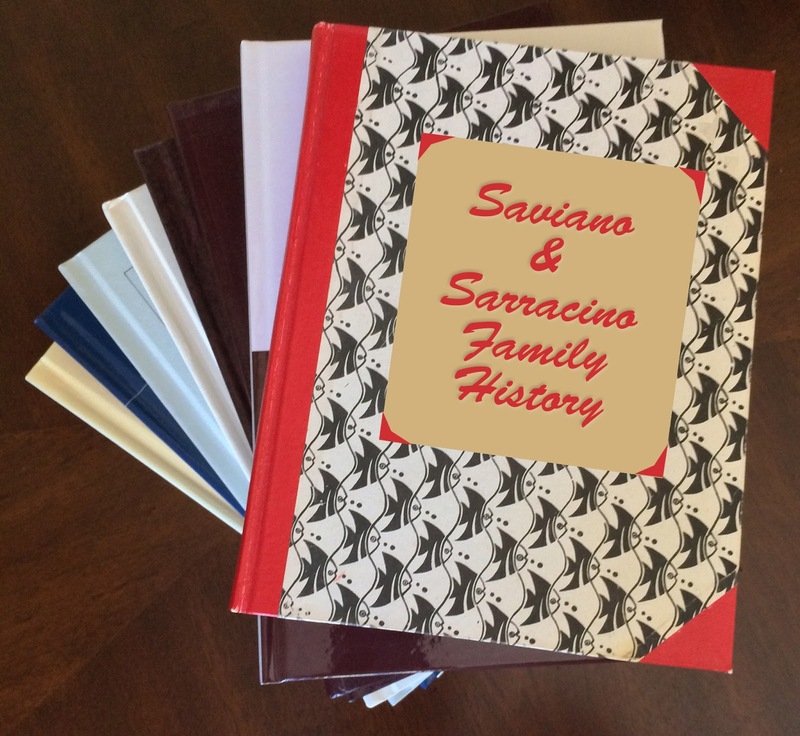 It contained useful Italian phrases and facts I'd gathered about my closest ancestors. My family tree was very small at that time, and I didn't have many documented facts. My plan was to use the few facts I had to explain who I was to the cousins I was about to meet. In the same notebook, I jotted down details from three cemeteries I visited in my ancestral hometowns. My husband took photos of graves, and I wrote the facts in my notebook. When I was able to visit with cousins, I wrote down a few details they were able to share. How I wish I'd taken better notes! But I was afraid of looking rude by paying more attention to my notebook than to my cousins. This morning I read that old travel notebook and compared it to my family tree and the cemetery photos. Past me, who'd scribbled all those notes, wound up providing present me with clues I didn't know I had! For example, my cousin Gennaro said his sister Maria had moved to New York City with her husband and four sons. I'd written down phone numbers for two of the sons, but I never called them. Using the names of Maria and her sons, I found documentation for them on Ancestry.com. Maria and at least two of her sons became U.S. citizens. I knew I had the right people because they all had the same address between 1967 and 1971. I learned that Maria and two of her sons died not long ago. And I had never contacted them because past me forgot to tell present me that their phone numbers were in that notebook. I missed my chance. My Italian cheatsheet alongside cemetery notes. This is a strong argument for digitizing everything you gather in your family tree research. Scan your official documents. Enter their facts into your family tree. This is true for notebooks, loose notes, and recorded conversations, too. Preserve the information and make it searchable by typing it into your word processing software. I don't want to throw out my 2005 travel notebook, even though my dog chewed it as a puppy. But it would be a terrible mistake to leave it in paper form only. What Should You Re-read Today? Next, past me is going to share old immigration notes with present me. When I took those notes, I didn't know if the people were related to me or not. I only knew that they had the right last names, so I wrote their facts down in a notebook. We'll see if present me can make a breakthrough with that old, forgotten information. To paraphase a TV ad campaign, "What's in your closet"?